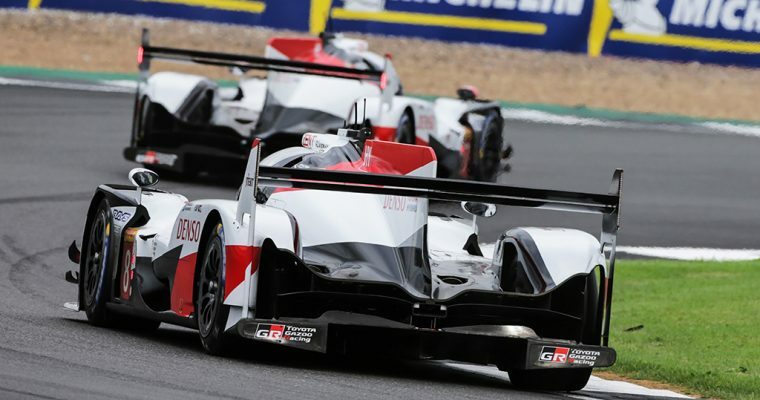 Toyota had little trouble scoring its third 1-2 finish of the 2018-19 World Endurance Championship super season at the 6 Hours of Silverstone, until it was excluded from the results a few hours after the endurance race had ended. In the #8 Toyota TS050 Hybrid LMP1 car, Fernando Alonso — who just announced his retirement from Formula One — alongside teammates Sebastian Buemi and Kazuki Nakajima, had led the #7 Toyota sister car in dominant fashion, but both cars then failed to pass a scrutineering test. According to the ruling, the #8 car had “deflected 6 mm on the right hand side and 8 mm on the left hand side under the specified 2500 N load at the front of the skid block,” and a similar infringement was found on the #7 car. The maximum legal movement is 5 mm. In other words, the floor of the car has deflected a little amount more than allowed during the six hour race, making the car technically illegal. Toyota explained that both cars had suffered damage to their front floor areas during the race as a result of impacts against the circuit’s new curbs, but the stewards rejected the explanation. Toyota Hybrid Drive: Why do people buy them? Toyota also pointed out that the design and construction of the plank had dated back to the beginning of the 2017 season and had passed the deflection test on many previous occasion/s, including at the 2018-19 season opener at the 6 Hours of Spa. Even with the disqualification, the #8 Toyota is still leading the championship. Unless more events like these take place, it should have no real trouble securing its top spot.